Terms of Sale All items sell strictly AS-IS and WHERE IS. Details and descriptions are provided to the best of our knowledge. No warranty or guarantee is expressed or implied. Please inspect all items to your satisfaction prior to bidding, as there will be no refunds, exchanges, or adjustments after the item is called sold. All buyers are responsible for their items from the moment that it is called sold. Please do not remove your purchases until payment has been made. Anyone wishing to bid on items in the auction should register and obtain a bidder card. Anyone bidding for an account other than their own must register as such. Auctioneer reserves the right to reject anyone who is not a registered bidder. Ligon Company charges all buyers a 10% buyers premium. There is an additional 2% Internet Purchase Fee charged on all online purchases. Applicable State of SC Sales Tax will be charged on all Lots. Bidders from outside the State of SC will be exempt from Sales Tax if they provide proof an approved tax exemption status form and exception certificates that are acceptable to the State of SC. Your credit card on file is for verification purposes only and will not be automatically charged following the auction. If you are the winning bidder you will need to contact The Ligon Company at 803-366-3535 to make payment arrangements. Credit cards accepted are Amex, Discover, Visa & MasterCard ONLY. NOTHING will be charged to your card until a purchase is made. Each transaction necessary to collect insufficient funds will have a $50 fee imposed. We will also accept a Money Order or Wire Transfer. There is a $5,000 Maximum on Credit Card Payments. Additional payment may be made by cashiers check, cash, wire transfer, or company check with bank letter of guarantee. Payment in full at the conclusion of the Auction in the form Credit Card or Wire Transfer. State tax laws apply. Failure to arrange payment by this date means you are subject to being placed on our Delinquent Bidder List that is displayed on our Home Page. Please contact our office at 803-366-3535 with any questions. The Auctioneer and Proxibid.com accepts no liability for loss or damage howsoever arising (including but not limited to costs of attendance of Bidders at the Auction) from any Lots not presented for sale. All purchases must be removed from the premises by Wednesday, March 27th, 2019. Bidders are to be held personally liable for any bids made with their Bidding Number. The highest bidder for each Lot shall be the Purchaser, and in the event of any dispute the Auctioneers shall have absolute discretion either to settle such dispute or to re-offer the lot for re-sale. The Auctioneer and Proxibid.com has described the Lot(s) in the catalog to the best of their ability and belief from information furnished by the Vendor(s) who shall be alone responsible for any error or miss-statement, which there may be. The Auctioneer and Proxibid.com undertake no liability whatever in respect of any faults, deficiencies and errors of any description, oral or printed, nor do they accept responsibility for the authenticity, genuineness, origin, age, condition or quality of any Lot(s) and all statements as to these matters whether contained in the catalog or made orally are statements of opinion only and not to be taken as being or implying a statement or representation of fact. Each and every Lot is sold as seen. The Auctioneer and Proxibid.com provides no guarantees or warranties (express or implied) in respect of the Equipment contained in the Lot. All representations made by the Auctioneer and Proxibid.com, its servants or agents are to be considered lay opinions only and the Auctioneer and Proxibid.com accepts no liability for any purchase made by a Buyer in reliance upon them. 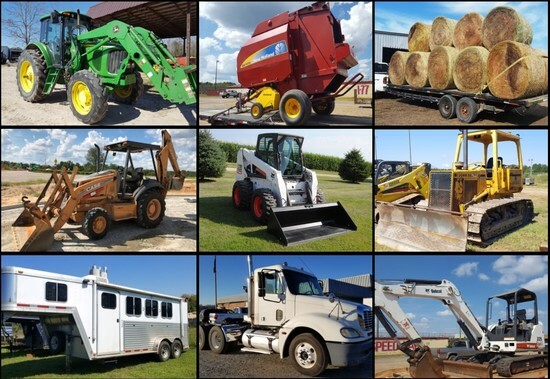 The Buyer agrees to insure the Equipment purchased against all losses from the Auction Date until removal of the Equipment by the Buyer. The Buyer acknowledges he/she has read and agrees to be bound by the additional terms and conditions set forth. Buyer representations: •	I have read and agree to the Terms and Conditions of Auction Sale as set forth herein. •	I understand that I do not have an agency relationship with The Ligon Company auctioneers, firm and all parties employed by or associated with. •	I understand that all items will be sold “As-Is, Where-Is”. •	I understand that, in the event I am the successful bidder, Ligon Company charges a 10% Buyers Premium (12% for Internet Bids) that will be added to the high bid and payable immediately as the Total Purchase Price. BY REGISTERING AND BIDDING, YOU HAVE ACCEPTED THESE TERMS AND CONDITIONS OF AUCTION SALE.